UPDATE: Nahida went through with her final eye operation on the 24th of February. We wish her a swift recovery. Pictures coming soon! Nahida is seventeen, and like the rest of the IDPs living in Dawoodia camp, she is Yazidi. Nahida shares two ‘caravans’ with her 5 siblings and parents. Her family was forced to leave their town of Rambusi, in Shingal, in August 2014 when ISIS invaded the region. The family made an escape straight for Duhok in their neighbours car. 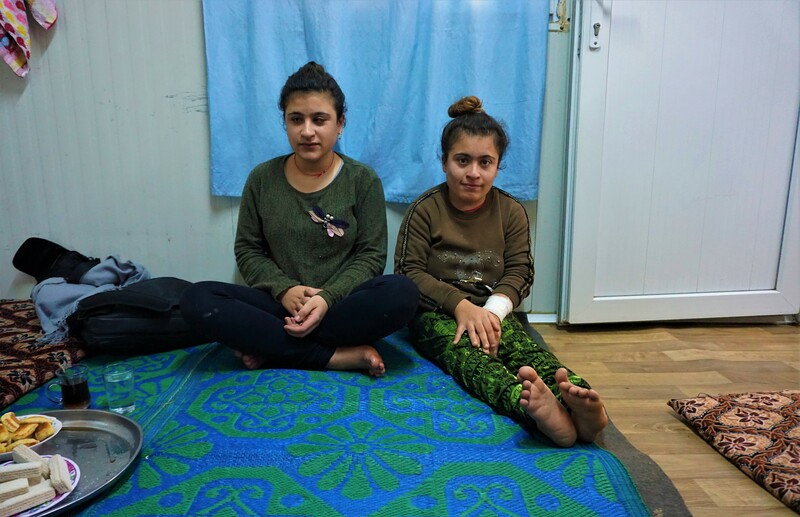 However, Nahida’s grandmother could not make the journey and was captured by ISIS fighters. They have had no news of her since. Nahida is a sweet and poised young woman who would one day like to go to school. She has been unable to study because she is afflicted with a congenital deformity causing severe strabismus in both her eyes. The condition was so severe, before she had surgery, her eyes were completely turned in towards her head. Though she already underwent one correctional surgery which has allowed her to regain some vision (though very blurry), she needs one last procedure to correct her eyesight. With your help, we can give her the chance to see for the first time and start studying! Please support us by clicking on DONATE button. All donations are spent on direct help to the victims of the war.